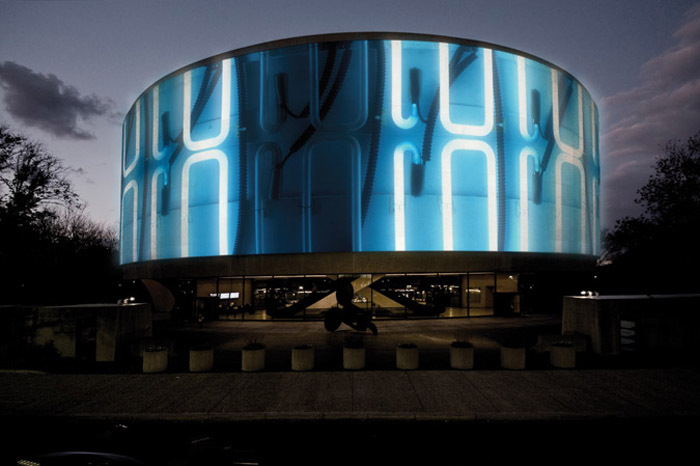 After not thinking about the Hirshhorn Museum in years, right on the heels of finding out about the plans for a bubbled garden (see previous post) is now news of the upcoming Doug Aitken installation, turning the exterior of the circular museum into a 360-degree projection screen. 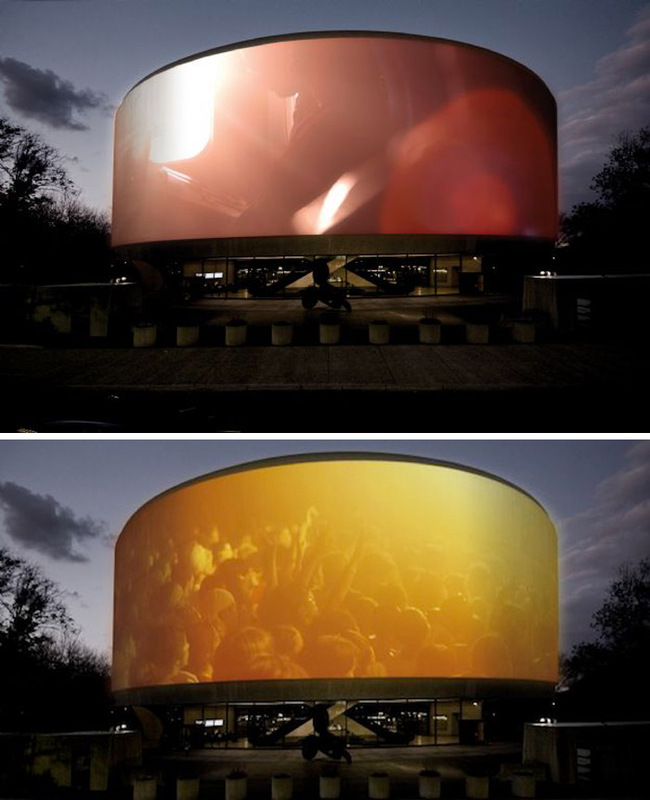 The piece, titled “Song 1”, will consist of 11 high-definition projectors streaming multichannel yet-to-be-disclosed images in conjunction with the song “I Only Have Eyes for You” with covers created and performed by several artists including Beck, and James Murphy of LCD Soundsystem, specifically for Aitken’s work. 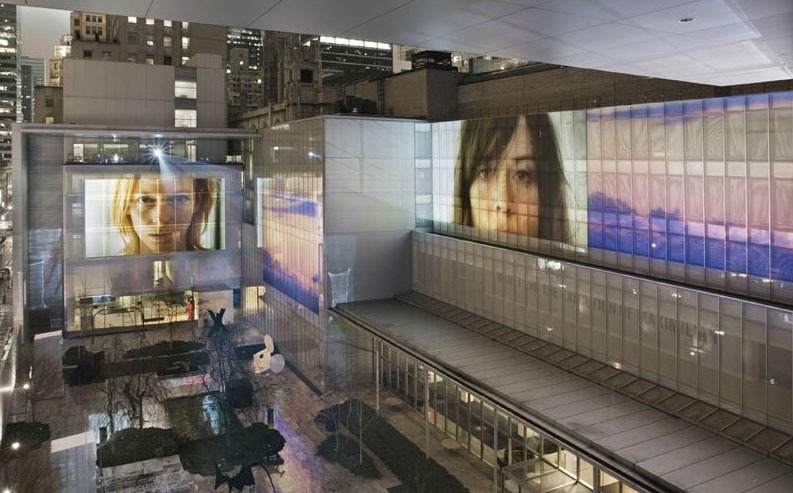 I’ve enjoyed everything I’ve seen by Doug Aitken, including his video installation Sleepwalkers at MoMA back in 2007 (where does the time go?!) which was also projected on the building’s façade (bottom photo). Based on past experience, this should be worth checking out. Maybe a trip to D.C. combining cherry blossoms and the Hirshhorn is in order this spring. This impressive project will be on view from March 22nd to May 13th, 2012. Renderings courtesy of the Doug Aitken Workshop. Bottom image courtesy of MoMA. This entry was posted in Art, Event, Film, Fun, Just Plain Cool, Stuff We Like. Bookmark the permalink.